Storm surge is water that is pushed toward the shore by the force of the winds swirling around the storm. This advancing surge combines with the normal tides to create the hurricane storm surge, which can increase water levels by 15 feet or more. Wind-driven waves also can raise water levels to devastating heights – causing severe flooding in coastal areas. Because much of the densely populated U.S. Atlantic and Gulf Coast coastlines lie less than 10 feet above sea level, the danger from storm surge is tremendous. In general, the more intense the storm, and the closer a community is to the right-front quadrant of the storm, the larger the area that must be evacuated. The problem is always the uncertainty about how intense the storm will be when it finally makes landfall. A damaging by-product of hurricanes can be tornadoes. Tornadoes are most likely to occur in the right front quadrant of a hurricane, but they are not limited to that area. They often spring out of feeder bands that come ashore well ahead of a hurricane. Meteorologists have no de nite way to predict whether one hurricane will produce more tornadoes than the next. Just because a hurricane has moved out of the area, it doesn’t mean you are safe from tornadoes. They can develop for several days because of the remnants of the low pressure system associated with it. If a tornado warning is issued, move to a small, interior room away from windows, or to an interior hallway on a lower oor. If that’s not possible, you can protect yourself by getting under heavy furniture or use a mattress to shield your body. Stay away from windows. Tropical storm-force winds are strong enough to be dangerous to those caught outside in them. Powerful, hurricane-force winds can easily destroy poorly constructed buildings and mobile homes. Debris such as signs, roofing material, and small items left outside become flying missiles in hurricanes. Extensive damage to trees, towers, water and underground utility lines (from uprooted trees), and fallen utility poles cause considerable disruption. High-rise buildings are also vulnerable to hurricane-force winds, particularly at the higher levels since wind speed tends to increase with height. Research suggests you should stay below the tenth floor, but still above any floors at risk for flooding. It is not uncommon for high-rise buildings to suffer a great deal of damage due to windows being blown out. Consequently, the areas around these buildings can be very dangerous. 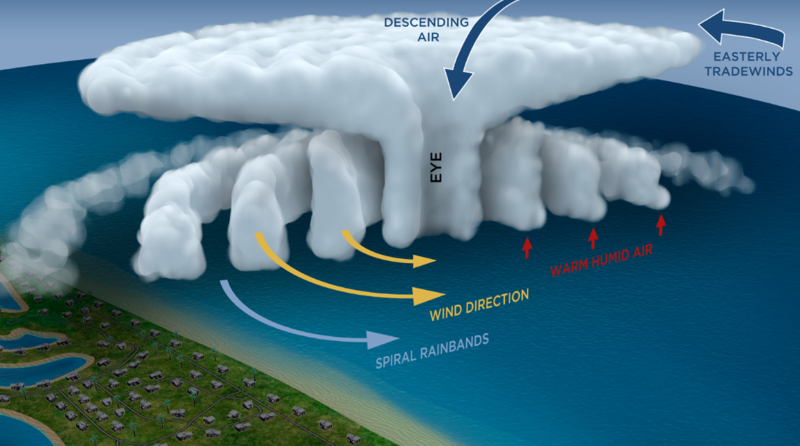 The strongest winds usually occur in the right side of the eye wall of the hurricane. Wind speed usually decreases significantly within 12 hours after landfall. Nonetheless, winds can stay above hurricane strength well inland. Hurricane Charley (2004), for example, battered DeSoto County (75 miles inland) with gusts to nearly 100 mph. When it comes to hurricanes, wind speeds do not tell the whole story. Hurricanes can produce storm surges, tornadoes, and often, inland fooding. While storm surge is always a potential threat, more people have died from inland flooding in the last 30 years. Intense rainfall is not directly related to the wind speed of tropical cyclones. In fact, some of the greatest rainfall amounts occur from weaker storms that drift slowly or stall over an area. Inland flooding can be a major threat to areas hundreds of miles from the coast when intense rain falls.